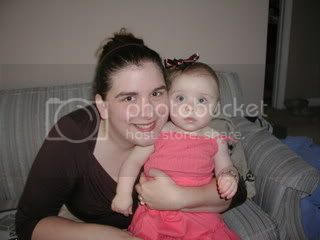 Yep, she's done this before but not to this magnitude, and luckily this time we didn't have a photo shoot planned. PHEW! What's the allure, anyway? She seems pretty proud of herself. Please tell me this is normal. I just hope she doesn't end up like this guy when she grows up. I don't know..... that man's kinda cute. Hope it washes out well! I don't know, we're headed to the bath right now. Will report on that later. Em... I'm getting the Color Wonder markers as soon as I get to a store! All my children also have the same fascination. Anytime my boys get markers out to color with they end up way more on them than on the paper. My 3 year old son understands how easy they are to wash off so when I get after him about writing all over himself he replies, "But Mom, they are washable." And this makes everything alright. Emma is not too this stage yet but we gave her a box of Crayons for Valentine's Day and she's already marked on the door frame! I am loving all the Color Wonder stuff that only works on certain paper. They have paint and markers. :) I don't get the window crayons though...doesn't that encourage a bad idea?! Window, wall, door? You'll have to check out Emma's new purse on my blog. lol There is one of her in her ModKid too but she was NOT HAPPY about it. I'll try again! Man oh man, kids are just too creative sometimes. 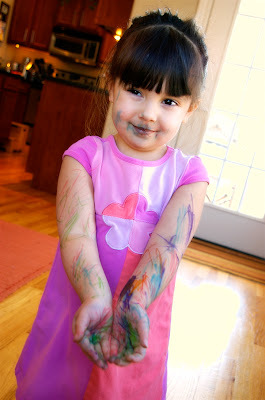 Yep, she may need to have Color Wonder markers only for awhile. Was she her only "casualty?" 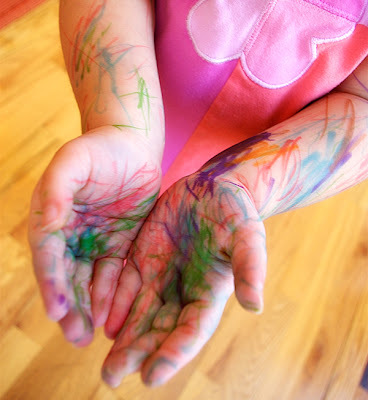 Hoping those scribbles didn't end up anywhere on your beautiful furnirure or nicely painted wall. HUGS Patty---you are a gem! Ohmygosh... that is so adorable! Seriously... I love it. Of course I don't have to give your little Kat Von D a bath! 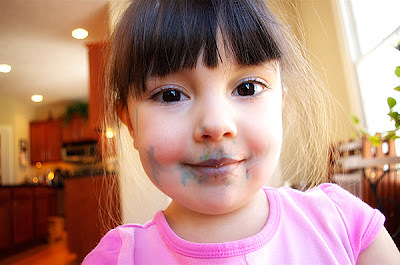 at least ONE of those markers was NOT washable...eeeek! The green came off immediately, and the orange took some rubbing but eventually came off, now, the purple (and maybe some blue) is still on there even after vigorous rubbing with soap and warm water. Oh well! I need to go through their "art supplies" and do some major purging! Normal, normal, normal....also why we keep the markers in a secure location! Ever wonder what's going on in their minds while their just drawing away? Too funny - what a mess! Oh I know the feeling. My daughter smeared Vaseline all over her hair on a day we did have a photo shoot planned. Argh...It took 8 washings with 4 differnt soaps to get it out. Cornstarch finally did the trick. Yes, Color Wonder is wonderful!